Question - Define International Marketing. Also explain why international marketing is important? Today, the world is shrinking through technology, and making it easier for marketers to reach global market. Marketing organisations now have to target not just domestic, but international markets. 1. Important to expand target market – Target market of a marketing organisation will be limited if it just concentrate on domestic market. When an organisation thinks globally, it looks for overseas opportunities to increase its market share and customer base. 2. Important to boost brand reputation – International marketing may give boost to a brand’s reputation. Brand that sold internationally is perceived to be better than the brand that sold locally. People like to purchase products that are widely available. Hence, international marketing is important to boost brand reputation. 3. Important to connect business with the world – Expanding business into an international market gives a business an advantage to connect with new customers and new business partners. Apple - the tech giant designs its iPhone in California; outsources its manufacturing jobs to different countries like - Mongolia, China, Korea, and Taiwan; and markets them across the world. Apple have not restricted its business to a nation, rather expanded it to throughout the world. The opportunities for networking internationally are limitless. The more "places" a business is, the more connections it can make with the world. 4. Important to open door for future opportunities – International marketing can also open door for future business opportunities. 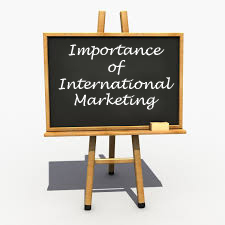 International marketing not only increases market share and customer base, it also helps the business to connect to new vendors, a larger workforce and new technologies and ways of doing business. For example – American organisations investing in Japan have found programs like – Six Sigma and Theory Z which are helpful in shaping their business strategies.